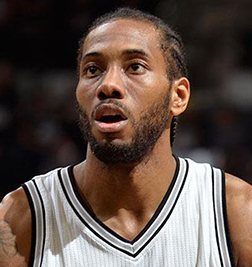 (Field Level Media) San Antonio didn’t need Kawhi Leonard to beat New York when the teams met five days ago in Texas, but the Spurs were happy to have him back Tuesday night in a 100-91 win against the Knicks at Madison Square Garden. Leonard, who missed the Dec. 28 matchup to manage his recovering quad injury, had 25 points on 8-of-20 shooting and grabbed eight rebounds in 30 minutes to pace San Antonio. After scoring 25 points in the Spurs’ 119-107 victory in their previous meeting, LaMarcus Aldridge finished with 19 points and five boards while Manu Ginobili scored 12 points and Pau Gasol had 11 and eight rebounds. San Antonio (26-12) bounced back from its 93-79 loss to a depleted Detroit team on the road Saturday to win for the seventh time in nine games. Kristaps Porzingis was one of three Knicks with 13 points and also grabbed nine rebounds. Courtney Lee and Lance Thomas also scored 13, Enes Kanter had 12 and Jarrett Jack chipped in 12 for New York. The Knicks (18-19) have lost five of their last six after Saturday’s 105-103 victory against New Orleans. Tim Hardaway Jr. missed his 16th straight game for New York due to a left leg stress injury. Ron Baker sat for the Knicks after suffering an orbital fracture while trying to defend an Anthony Davis dunk Saturday. Baker, officially day-to-day, will be fitted for a mask and is likely to return Wednesday on the road against Washington. The Spurs were playing their second straight game without Rudy Gay, who is sidelined with retrocalcaneal bursitis in his right heel. The Spurs led just 52-49 at halftime behind a 15-point half for Leonard, but managed to outscore the Knicks 29-18 in the third. Courtney Lee’s 3-pointer with 6:18 remaining brought New York within 90-82. Willy Hernangomez made 1 of 2 free throws at the 5:42 mark to make it a 7-point game, but San Antonio scored 10 of the next 18 points to close out the win. San Antonio completes its three-game road trip Wednesday in Philadelphia.